About a year ago, we started getting milk delivered – you know, like how people used to back in the Eighties. No longer do we have to carry weighty flagons of milk in amongst the rest of the big shop; now it just materialises on our doorstep, as if by magic. Milk usage is a hard thing to predict. It wasn’t something we were especially aware of back when we had one giant milk throughout the week, but now we occasionally find ourself lining up a trio of bottles or more in our fridge door. At this point, milk consumption suddenly seems a pressing issue. Being pathologically disinclined towards ‘sinful waste’ our only course of action when this happens is to drink shitloads of milk. We wonder whether Jonny Bairstow might be about to do the Test hundred scoring equivalent because it rather seems like he might have a few backed up. It’s reassuring when less established England batsmen start showing signs of being untroubled by county cricket. It makes you think that maybe they do stand a chance of doing well in Tests. Last year, Jonny Bairstow made five County Championship hundreds for Yorkshire, including an unbeaten double. This year, he made 246 against Hampshire and 198 against Surrey. He also hit this six, which we still can’t get our head around. Throw in a first Test hundred against South Africa during the winter and it seems likely that good form has become sufficiently prolonged as to be considered ‘class’. Against this backdrop, it didn’t seem at all surprising that Bairstow should cruise to 140 against Sri Lanka today. Hopefully he still has a whole bunch of three figure scores just chilling in his fridge door, waiting to be extracted. Three catches too. Take that Buttler-fans! Ben Stokes makes a wicket happen. I did enjoy him hitting the language hard in the Badger as well. Chap At Work: What did England get? 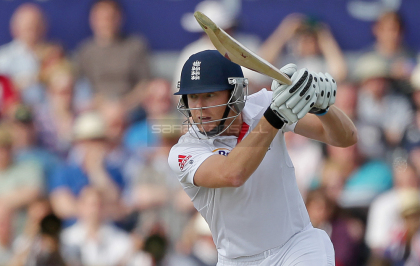 Me: 298 – Bairstow 140. Could get a lead if they’re lucky? Chap At Work: They’ll skittle them and enforce the follow-on, I reckon. Me: (Thinking “yeah, whatever pal…”) Umm.. that’d be good. The rest is (extremely recent) history. Some kind of seer. He’d have been treated with more respect back in pagan times. Does the ‘we’ imply multiple persons, or that the individual receiving the milk is indeed a royal as his realistic internet moniker suggests? Neither. Just a long since redundant collective editorial voice that confuses everyone.